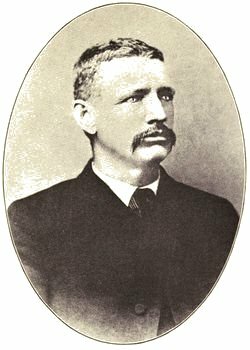 Having made landfall Bill first took a job at the New York City Fire Department but before long he headed for the frontier where presumably his inclinations towards violence would be less burdensome. For a short time he had been a member of the Bismarck police force but that gig ended one day when Hell Roaring Bill beat the mayor of Bismarck over the head with his gun. Bill moved to Medora where he hoped to find a more progressive mindset. In spite of their obvious differences in education, pedigree, social standing, and wealth, he and Theodore Roosevelt became friends. One of Roosevelt’s own memories of “Hell Roaring Jones” took place in 1886. Roosevelt had just traveled back to Medora from Dickinson to participate in the county’s first election as an organized governmental entity. There had been a great deal of concern that the outlaw element would import a carload of railroad section hands from outside the county to vote against the effort to establish organized government in the Badlands. Those concerns were not entirely unfounded. “I did not reach Medora until the election was well underway. I then asked one of my friends if there had been any disorder. ‘Disorder hell!’ said my friend. ‘Hell Roaring Bill Jones just stood there with one hand on his gun and the other pointing over to the new jail whenever any man who didn’t have the right to vote came near the polls.